Hey readers! We hope you had a magical Christmas, and enjoyed time spent with family and friends! We're kicking it back into gear after a few days of vacation, and we're so excited to be partnering with our friends at Pink Blush to bring you a fabulous New Year's Giveaway! Pink Blush is one of my absolute favorite online boutiques. They have gorgeous maternity clothing, and everyday boutique styles for women. Pink Blush has adorbs accessories, and shoes, too! To start off the new year right (just a couple of days away! ), we're giving away a $50.00 Pink Blush Gift Code to one lucky reader! Giveaway info is below. Get to entering and good luck! Head on over to Pink Blush to shop hundreds of beautiful maternity looks, or everyday boutique styles for women. Keep up with Pink Blush through Facebook, Twitter, Pinterest, Instagram, and YouTube. 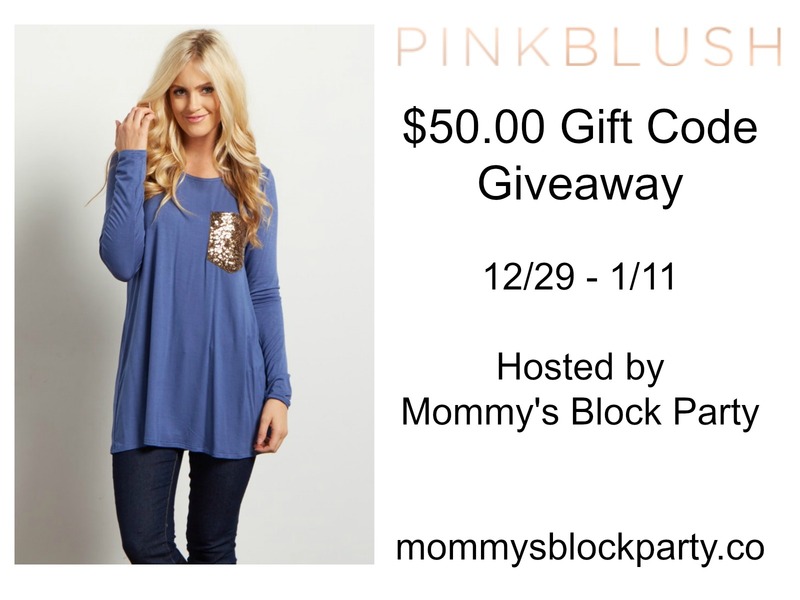 One lucky MBP reader will win a $50.00 Pink Blush Gift Code! Giveaway is open to US residents, 18 and older. Just use the handy RC entry form below to enter for your chance to win! MBP is not responsible for prize fulfillment, Please see our policies page for details. 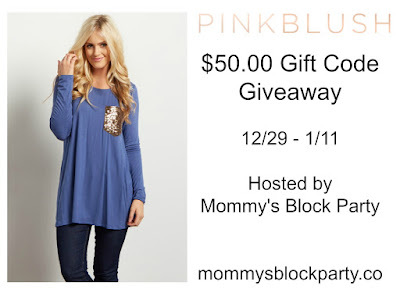 Special thanks to our friends at Pink Blush for sponsoring this fabulous holiday giveaway! I would give it to my wife and let her decide what to purchase. I would order the... Charcoal Floral Printed Sweater Dress. Looks nice a warm for the winter months. I would get the black tribal print sash tie top. I would buy the burgundy lace dress. I would get the Mint Green Floral Dress. I love the Ivory Floral Maxi Dress! I would have to get that. I would love to have the "Grey Tribal Asymmetric Cardigan" I just love it! I am also loving the "Burgundy Striped Cardigan" Adorable! I would purchase a dress. I'd get the Mauve Basic Knit Tunic. I would get the Purple Floral Wrap Dress. Very pretty. I am also loving the "Grey Floral Pajama Pants" They are pretty & look so comfy! I especially like this. http://www.shoppinkblush.com/p-13399-black-striped-crochet-neckline-maternity-top.aspx?DepartmentID=2. Thanks! I would get a floral printed dress. ohhh the gold sequin evening gown is stunning! my wish list is so long lol. Id also like to have the taupe button up blouse. I would get the tunics and or some floral pajamas pants. Thanks for the chance to win such an amazing giveaway.